Perfect conditions? Summer's finally here. A perfect day on quiet country roads. Elevated fire risk, the level is Extreme! Fresh harvested sunshine, in the form of hay. Look up, look way up... summer!!! 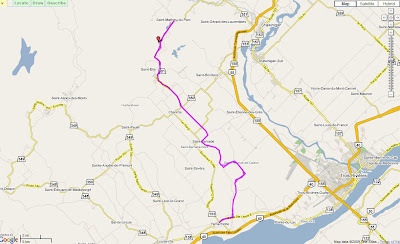 We did a north-south ride today near Trois-Rivieres. Starting at convenient Yamachiche, we rode north to St-Thomas-de-Caxton, St-Elie-de-Caxton, and up through the real northern forest to St-Mathieu-du-Parc, and then we came back the same way. The same way, except it was downhill, which is usually the better way. The map on Bikely is here. Conclusion, a great 100 km ride, perfect summer weather, a great way to spend Fête St-Jean. Here is the MRC Maskinongé's cycling map. Pink highlights are our recent explorations. Looking for awesome shorter rides?